The big green guy with the bad bad breath is back… and the Jean Cocteau has him. SHIN GODZILLA, the first new Japanese Godzilla film in ages, is showing at selected theatres around the country for a limited run, and we’re one of the theatres selected! (The only one in New Mexico, I believe). It IS a limited run, though, and we have only two more screenings remaining — Saturday afternoon at 1:00 pm, Sunday evening at 7:30 — so if you want to get your kaiju fix for the year, go the Cocteau website and snap your tickets up now. Ogre Jenni speaking! 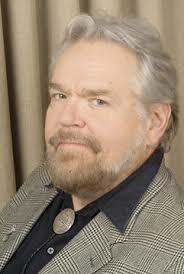 I am one of George's assistants here in Santa Fe. 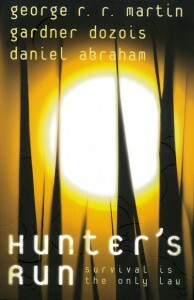 The Jean Cocteau Cinema Bookstore just received some copies of Hunter’s Run, a science fiction story with a psychological thriller backbone, by George R.R. Martin, Gardner Dozois, and Daniel Abraham. Running from poverty and hopelessness, Ramón Espejo boarded one of the great starships of the mysterious, repulsive Enye. But the new life he found on the far-off planet of São Paulo was no better than the one he abandoned. Then one night his rage and too much alcohol get the better of him. Deadly violence ensues, forcing Ramón to flee into the wilderness. Mercifully, almost happily alone—far from the loud, bustling hive of humanity that he detests with sociopathic fervor—the luckless prospector is finally free to search for the one rich strike that could make him wealthy. But what he stumbles upon instead is an advanced alien race in hiding: desperate fugitives, like him, on a world not their own. Suddenly in possession of a powerful, dangerous secret and caught up in an extraordinary manhunt on a hostile, unpredictable planet, Ramón must first escape . . . and then, somehow, survive. And his deadliest enemy is himself. Each book is signed by all three authors, and you may purchase your copy here. There are only a handful of copies available, so order quickly! If you have an inquiry about international shipping, please email jeancocteausantafe@gmail.com for a quote. (Yes, yes, Cocteau was French. But there was lots of back and forth between the Scots and the French, y’know. They called it the Aulde Alliance). We’re having a very special event this week at the Cocteau: a week-long marathon of the entire first season of OUTLANDER, the brilliant television adaptation of Diana Gabaldon’s bestselling novels. We’re showing all sixteen hours, and best of all: admission is FREE. The marathon is already half over, alas… but you can still catch the second half of the season, tonight, Saturday, and Sunday. We’ve had all kinds of fun special events too. 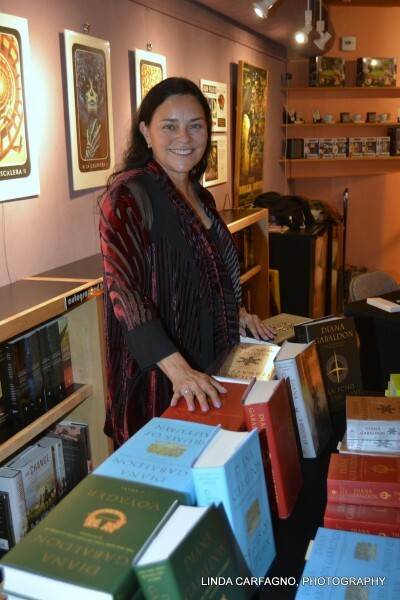 We had Diana Gabaldon herself the first two nights, talking, answering questions, signing books. We had men in kilts. We had a tasting of single-malt Scotch. (No haggis, though. Have to draw the line somewhere). Last day at home. Tomorrow Parris and I fly east for the wedding, and some time in NYC with my agents and editors, and the baseball game on Staten Island (Go Direwolves!). Speaking of the last, I am told tickets are almost sold out, so if you want to come, snag some now. The first 2500 fans at the stadium will get Direwolf hats. The first 400 in line will be able to get an autograph. Wild Spirit Wolf Sanctuary will be there as well, with one of their “envoy” wolves, and there will be a fund-raising raffle for the player jerseys. While I love travel, I hate getting ready to travel. The last day at home is always stressful. Too much to do. I won’t be blogging much, or reading email, while on the road, so I expect this space will go silent for a week or so. Don’t worry, that doesn’t mean the Puppies got me. Remember, he who hesitates is lost. 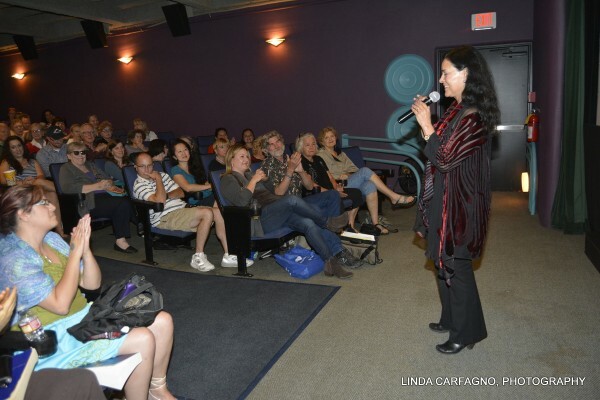 Oh, before I forget… for those of you still in New Mexico, be sure and swing by the Jean Cocteau Cinema on Monday, August 3 for one of our famous (infamous) author events. 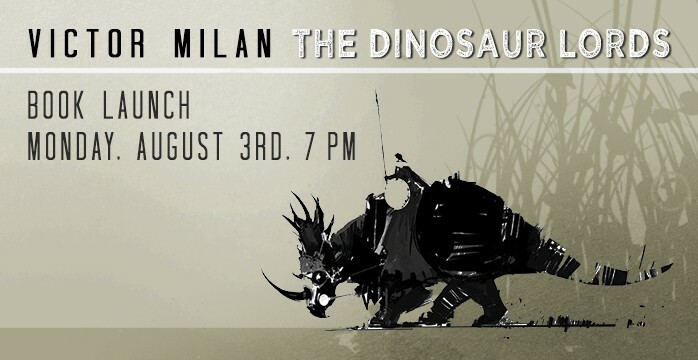 Wild Cards stalwart VICTOR MILAN (creator of Cap’n Trips) will be on hand to read and sign copies of DINOSAUR LORDS, the first volume of his new epic fantasy series. Hey, knights riding dinosaurs, what could be cooler than that? 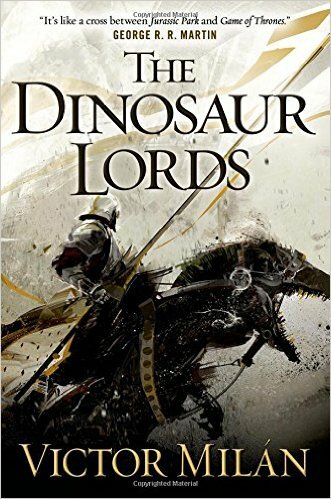 Come join Vic and the gang, grab your copy of DINOSAUR LORDS… another great TOR book… and make him sign some Wild Cards books as well. We’ll have those available at the JCC as well, already signed by me (and in some cases by other writers). … to the Jean Cocteau.<br/><br/>Opening this Friday, July 24, we have PIXELS, for all of you who remember the videogames of your youth.<br/><br/>&lt;lj-embed id=”577″/&gt;<br/><br/>Adam Sandler. Peter Dinklage. PacMan. Looks like a hoot and a half.<br/><br/>See you at the movies. … but not to the Jean Cocteau Cinema. 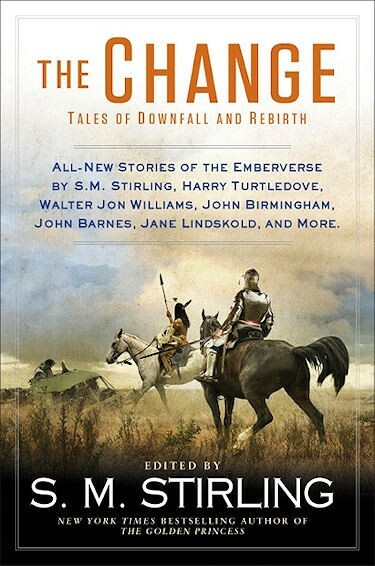 We have our latest author event scheduled for Monday: a launch party and booksigning for the original anthology, THE CHANGE, edited by S.M. 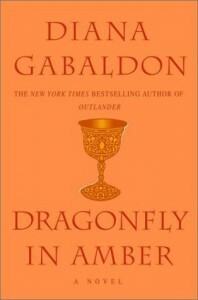 Stirling and set in his “Emberverse” universe. Steve himself will be on hand, of course… what’s more, he’s arranged to bring in nine of the writers who contributed stories to THE CHANGE, including DIANA PAXSON, WALTER JON WILLIAMS, JANE LINDSKOLD, JOHN JOS. MILLER, and EMILY MAH. MATT (M.T) REITAN, KEIR SALMON, VICTOR MILAN, and LAUREN TEFFEAU will also be attending. The event starts at 7:00 pm. We will have some readings from the stories, a panel discussion moderated by Steve Stirling himself, a q&A with the audience, and of course a mass signing session where you can get your copy defaced by all the writers. HOWEVER… because we cannot possibly get ten writers up on the little itty-bitty stage at the Jean Cocteau, we have moved this event down the road a little, to the brand new VIOLET CROWN CINEMA two blocks south. They have lots more room than we do. (And a whole lot of cool beers on tap as well). In the midst of all this, wars old and new continue to rage all around me. I had rather hoped that the Puppy Wars would have died down by now. Naive of me. Far from it, things keep getting worse. 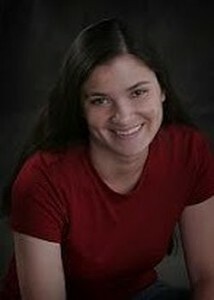 All the grisly details of this ongoing nastiness can be seen at FILE 770 over at http://file770.com/. ((Mike Glyer deserves the 2016 Best Fanzine Hugo for his even-handed and thorough coverage of Puppygate, linking to virtually everything posted on the subject anywhere on the internet)). I want to single out the postings of Eric Flint. 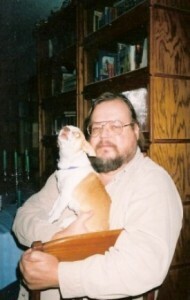 The latest, at http://www.ericflint.net/index.php/2015/06/09/a-response-to-brad-torgersen/ , is a devastating point-by-point deconstruction and refutation of the latest round of Puppystuff from Brad Torgersen. Flint says what I would have said, if I had the time or the energy, but he says it better than I ever could. 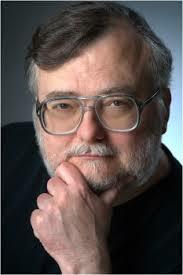 ((I will be nominating him for a Hugo too. For Best Fan Writer)). His earlier posts on Puppygate are all worth reading too. He is a voice of reason in a sea of venom. I will add one point. The emptiness of the Puppy arguments is indicated clearly by how much time they seem to spend in coming up with new insulting terms for those who oppose them. The facts are against them, logic is against them, history is against them, so they go for sneers and mocking names. First it was SJWs. Then CHORFs. The latest is “Puppy-kickers.” Next week, no doubt, they will have something else. Reading all the blogs and comments that Glyer links to from FILE 770 has convinced me that anyone who starts throwing these terms around can pretty much be discounted; you will find no sense in what they say, only sneers and talking points. Meanwhile, other wars are breaking out on other fronts, centered around the last few episodes of GAME OF THRONES. It is not my intention to get involved in those, nor to allow them to take over my blog and website, so please stop emailing me about them, or posting off-topic comments here on my Not A Blog. Wage those battles on Westeros, or Tower of the Hand, or Boiled Leather, or Winter Is Coming, or Watchers on the Walls. Anyplace that isn’t here, actually. Yes, I know that THE HOLLYWOOD REPORTER named me “the third most powerful writer in Hollywood” last December. You would be surprised at how little that means. I cannot control what anyone else says or does, or make them stop saying or doing it, be it on the fannish or professional fronts. 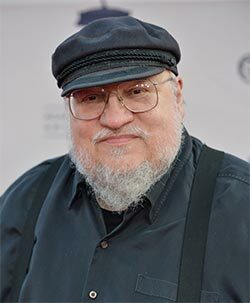 What I can control is what happens in my books, so I am going to return to that chapter I’ve been writing on THE WINDS OF WINTER now, thank you very much. 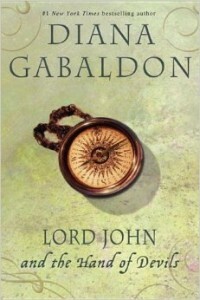 If you haven’t been watching OUTLANDER, you’re missing a terrific TV series. Gorgeous to look at, and the performances by the three leads are terrific. Tobias Menzies, who played Brutus on HBO’s ROME and Edmure Tully on GAME OF THRONES, is especially noteworthy in a double role. (I just hope we’ll be able to get him back, if and when D&D decide to return to the riverlands). 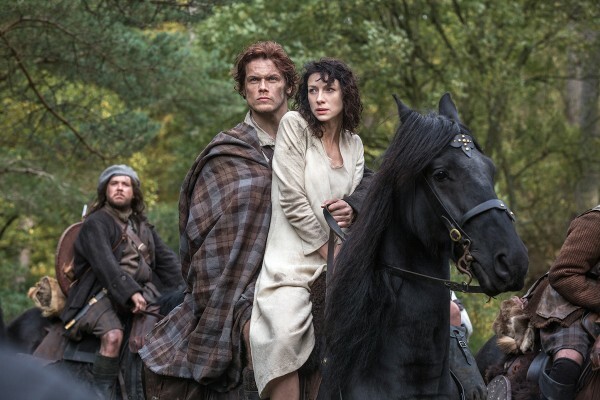 (OUTLANDER ‘feels’ like a cross of historical fiction and romantic adventure, but the time travel element definitely qualifies it as SF, or at least fantasy, so it’s a show worth remembering next year when Hugo nomination time comes round again). OUTLANDER films in Scotland, GAME OF THRONES primarily in Northern Ireland. Between the two shows, I doubt there’s a single major actor in the British Isles we haven’t used yet. Great casts. 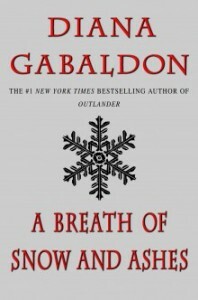 Diana got sixteen episodes for one novel, two eight-episode half-seasons, which had me gnashing my teeth in envy… until I remembered that OUTLANDER has no dragons, direwolves, or ice zombies, and so far no major battles either. Though, if I recall my history, that will be coming… the battles, that is, not the dragons. 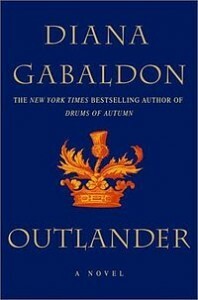 … but we do have the OUTLANDER books. While they last. And lots more besides. UPDATE: Alas, we’ve just gotten word that Deborah Harkness’s flight has been cancelled, and she is stranded in Chicago at O’Hare. 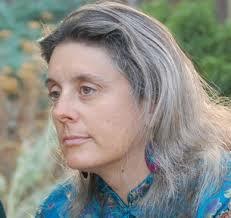 Given her tight touring schedule, we’ve had no choice but to cancel her appearance tonight at the Cocteau. We will reschedule as soon as her schedule, and her own, permit. 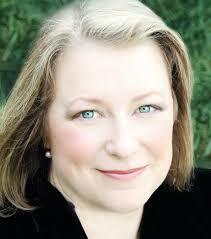 The Jean Cocteau will be having another terrific author event tomorrow (hmmm, actually it would be today now, looking at the clock — anyway, Monday evening), when we welcome bestselling fantasist DEBORAH HARKNESS to Santa Fe. 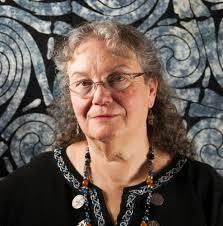 Deborah will be reading from her latest novel, THE BOOK OF LIFE. 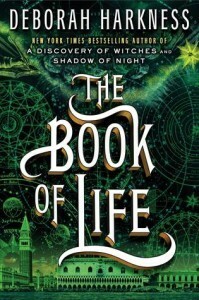 Afterward, Lorene Mills of REPORT FROM SANTA FE will be interviewing the author about her work, and Deborah will be signing copies of THE BOOK OF LIFE and her other novels. The event starts at 7:00pm. See you there. (For those unable to attend, autographed copies should be available by mailorder from the Jean Cocteau bookstore). The next big feature coming to the Jean Cocteau Cinema.